A beautifully preserved antique American quilt, completed in 1875, is kept in the Milwaukee Art Museum’s decorative arts collection (figure 1). Simply titled the “Star of Bethlehem” Quilt, it displays an abundance of color, pattern and texture. Upon viewing it, one cannot help but admire the precision, technique and time that clearly went into its making; the star, itself, may evoke a spiritual response. It is antique quilts such as this one that tend to be kept in present-day museum collections. Sometimes referred to as “fabric paintings,” quilts are often idealized as crafts of the past. Quilts made throughout the nineteenth century displayed wild patterns, marked important events or showed political support, particularly during the Civil War, but what is to be done with the quilts that were not intended to be artworks or symbolic mediums? What can purely functional antique quilts offer contemporary viewers if not awe-inspiring aesthetics? At the Mt. Horeb Historical Society, an “Irish Chain” quilt (figure 2) lays folded in a cardboard box, hidden from visitors of the museum unless purposefully sought out. The quilt was completed in 1865 by then sixteen-year-old Ellen Sweet in Springdale, Wisconsin. It is very clear that Ellen was not trying to create a unique “fabric painting” in her stitches, but rather produced a quilt that was simply meant to keep one warm and be used practically by her own family. As will be discovered, Ellen was quite limited when it came to her individual creativity due to her geographic location, skill level, social roles and the larger trends and technological innovations available to her in the pioneer days of America. However, though certainly not to be valued for its “wonder,” Ellen’s quilt can and should be valued for its cultural “resonance.” The material details of this quilt speak to Ellen’s specific cultural situation and mark a pivotal point of transition, for Ellen herself and for America at large. The foundation of this argument builds upon pre-existing theories put forth by literary critic Stephen Greenblatt and anthropologist Tim Ingold. It is Greenblatt who initially proposed the terms “wonder” and “resonance” to describe the effects of museum objects on contemporary viewers. Wondrous objects are those like the quilt at the Milwaukee Art Museum; they draw viewers by their beauty or distinctive features. Objects of resonance, in contrast, have the power to extend beyond pure aesthetics and speak to larger cultural patterns. Similarly, Tim Ingold emphasizes a connection between specifically handcrafted items and culture; he explains that such items are not created as individually conceived ideas, but rather “grow from a mutual involvement of people and materials in an environment.” Although Ingold uses the example of weaving a basket, his ideas can easily be applied to a number of handcrafts. Ellen’s quilt serves as a perfect example for these theories; in its own time, the quilt was molded entirely by its culture, but now it serves as a reflection of that culture. Little beyond major life events and familial relations are recorded about Ellen Sweet (figure 3). In 1855, when Ellen was six years old, her family of nine moved to Springdale, Wisconsin from Chautauqua County, New York; they had obtained their land prior to the move in 1854. Wisconsin had become an official territory in 1836, increasingly drawing immigrants and settlers to its growing communities for decades after. From 1836 to 1850, Wisconsin’s population grew from 11,000 people to over 300,000. Many were interested in the potential industrial and commercial use of Lake Michigan’s harbors, in addition to the availability of land. In the early 1850s, the Wisconsin Commission of Emigration distributed pamphlets and published newspaper advertisements in Europe, as well as in cities along America’s east coast, to encourage settlement in Wisconsin. Although aimed at Europeans then arriving in America, perhaps Ellen’s family saw one such advertisement and sought the better life that Wisconsin promised. Taking a boat from Buffalo to Milwaukee, and then traveling to Springdale by wagon, the Sweet family began their life in Wisconsin, which would continue for generations. The “host,” mentioned in the quote by the Norwegian pastor, was undoubtedly the woman of the household. As Helen Sheumaker points out in her book, Love Entwined, it was men who built and supported a house, but women who made that house a home; a beautiful and comfortable place to live. Making this quilt at sixteen years old, Ellen would have been preparing herself for womanhood; just three years after completing her quilt, she married John Donald, a local farmer, and started her own family. The role of wife and eventual mother required Ellen to learn basic domestic tasks in this time period. As a grown woman, she would be expected to cook, keep the home clean and take care of her own children someday. Domestic craftwork, including quilt-making, was also under the woman’s jurisdiction. Ellen would have learned these tasks from her mother in a process that Rozsika Parker, in her book The Subversive Stitch, describes as “transmitting feminine behaviour.” Domestic work defined women’s identities and societal roles; it was a matter of social obligation and expectation. Delma Sweet, Ellen’s granddaughter who eventually received the quilt, notes this role for women in the quote that she left the Historical Society (see cover page): “…every girl had to piece a quilt.” Ellen’s mother, Sally Clark Sweet, left behind evidence of her own quilting activities from around this same time; her “Rose Wreath” appliqué quilt from 1855 (figure 5) displays her superior skill that came with years of practice. Because Ellen was still learning, her quilt does not display the same level of aesthetic quality and technical aptitude as her mother’s, but both certainly attest to this tradition of female domestic education and women’s roles in the home. As already discussed, Ellen’s quilt can certainly be seen as a direct result of her nineteenth century feminine education, but its purchase and materiality reflect its chosen function as a utility quilt. Further, the popularity and availability of the specific fabrics and dyes were essentially determined by larger trends and developments in America’s textile industry at the time. It would perhaps be more pleasant to think of Ellen choosing the fabric for her quilt because special meanings were fixed into the particular colors and textiles. In reality, Ellen would have been limited in her choice of fabric and color, making her decision actually quite simple. No general stores appear to have been established in Springdale when Ellen was working on her quilt, but nearby Mt. Vernon had a general store opened as early as 1848. Ellen’s family likely purchased the fabric she used from this store, having been offered a narrow selection to choose from. A lack of textile mills in the area meant that textiles had to be brought in from larger cities. The store merchant dictated what fabrics would be ordered and sold in the store, but what was being made by the textile mills elsewhere was controlled by popular trends and the available technology. Ellen’s use of cotton speaks to newer developments in American fabric production at the time. Since Eli Whitney’s invention of the cotton gin in 1793, cotton had become a widely available and inexpensive fabric in America. Before 1800, it was uncommon to make quilts entirely out of cotton simply because the fabric was hard to come by and more expensive. Not only favored for its reasonable price, cotton, to this day, is loved for its comfortable texture, ease of washing and overall versatility. Ellen’s family could have used their purchased cotton for not only quilt-making, but to craft sheets, coverlets, tablecloths, clothing and other items, as well. To give the calico pieces their deep blue color, the fabric had been dyed in a factory prior to being sold. The likelihood of Ellen, her mother, or her sisters dying the fabric themselves is very slim as “printing fabric was never a widely practiced home craft in this country.” Aniline dyes, or synthetic dyes, which would greatly expand the range of colors that could be created, were just starting to be developed around this time. Because those had not yet become widely available to the American market, fabrics were restricted to using dyes produced from insects, vegetables and minerals. As a vegetable dye, Indigo dates back to early civilization, but has remained popular throughout time. Described as “colorfast,” Indigo dye is known for its ability to withstand fading, even when washed multiple times. The choice in color and fabric indicate that this quilt was meant to last a long time under continual use. In its overall simplicity, Ellen’s pattern for her quilt further displays its practical purpose, while concurrently demonstrating a popular style for its time. However, its ease of construction, along with the smallest of imperfections in measurements and straight sewing, attest to the fact that Ellen was still in a state of learning. As mentioned previously, Ellen’s mother, with her years of practice and experience, would have been instructing Ellen on increasingly difficult techniques as she moved towards womanhood. The pattern Ellen followed to design her quilt is commonly called the “Single Irish Chain.” The identifying feature of this pattern is the connection of smaller squares to create diagonal lines across the quilt, forming a large checkered pattern. Interestingly, recent scholarship has found no connection between Ireland and this particular pattern, despite its name. Stella Rubin, an antique quilt expert, theorizes that the Irish Chain might have been one of the earliest quilt patterns used in the United States due to “the dynamism of its simple geometry and relative ease of assembly.” Similarly, Barbara Brackman has dated the naming of this pattern to the early nineteenth century, explaining the possibility of it stemming from a previously established weaving pattern. Patterns, in general, were not formally published until the late nineteenth century, so dating and proper attribution are difficult. Ellen had likely learned this pattern from her mother, who had also learned it from her own mother or from a friend. With many examples surviving today, it is clear that this pattern was used often throughout the nineteenth and twentieth centuries, but most seem to have made double or triple Irish Chains; this simply involved adding rows along the initial diagonals. 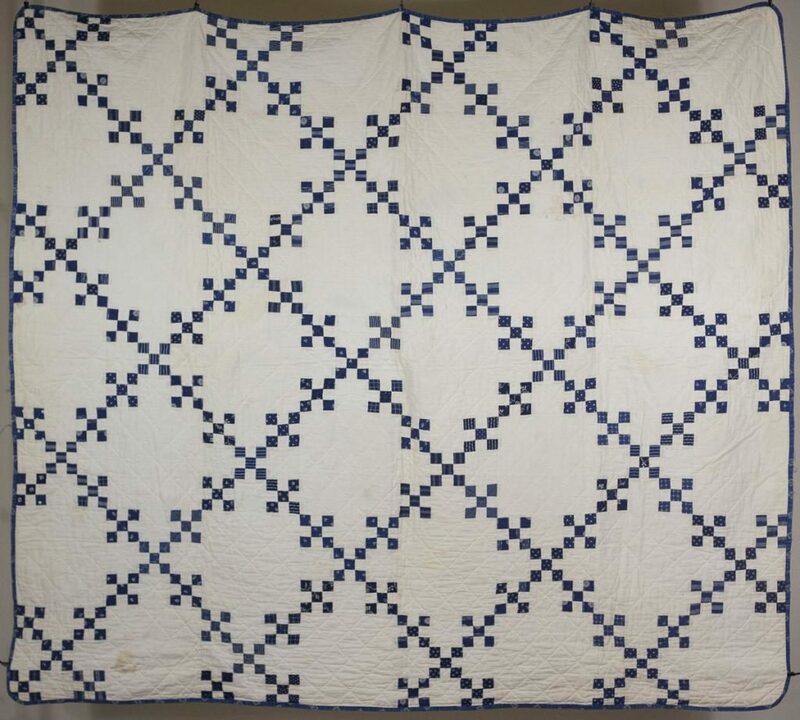 As Rubin noted, the construction of Ellen’s quilt was not extremely difficult, compared to other patterns of the time period, and consisted of a relatively simple process. The entire quilt is made up of larger squares that were sewn together by machine; each of those squares is called a block. To create the Single Irish Chain pattern, Ellen alternated between pieced blocks and plain white ones. Piecing involves joining fabric together by a single seam; though a machine was used for the joining of the larger blocks, Ellen pieced the smaller squares by hand, evident in the wider distance between stitches. Each pieced block, in this particular case, is made up of nine smaller squares, set in rows of three, and alternates between indigo and white squares. The use of nine-square blocks is more formally called the “Nine Patch.” Children who were just learning to make quilts often used the Nine Patch across entire quilts to learn how to piece. Its simplicity also made it a favorite pattern for quilts that were wholly utilitarian in function. As a young woman, with probably years of quilt-making lessons, Ellen’s design goes beyond the basic Nine Patch to show her increased skill level. In addition to the formation of the Irish Chain pattern, her design includes a framing edge of calico binding and an “allover diamond pattern,” stitched by hand, to join the top, middle, or batting, and bottom layers. Ellen’s partial use of a sewing machine is significant because its recent invention not only changed the way women were sewing; it caused changes in women’s social lives, as well. Sewing machines, in general, have a complicated history due to the fact that many past figures around the world invented similar models, but most early designs did not peak public interest or were never patented. It is difficult to firmly declare a single inventor of the modern sewing machine. In America, a man named Walter Hunt created a sewing machine in the early 1830s that produced a “lock stitch,” clearly differentiating its work from hand-stitching. Never patenting his design, Hunt left Elias Howe able to patent his slightly “more sophisticated model” in the 1840s, but he had trouble marketing to the public. To really get the American public interested in purchasing sewing machines, it took improvements by Isaac Singer in both design and marketing. Adding a foot pedal and a vertical needle, Singer’s first machines were listed at a costly five hundred dollars each. To reach middle class audiences, Singer devised a payment plan, and soon demand itself was enough to lower the prices. By 1860, each Singer sewing machine could be bought for seventy-five dollars, and by 1871, they were sold for as low as twenty-five dollars. In a mere twenty year span, the sewing machine became a common household item. The invention of the sewing machine stands at a pivotal point in American society. After 1865, urbanization and industrialization expanded rapidly across the country. In Ellen’s case, factory-produced and dyed fabric was already common, but more factories and new developments in technology brought upon even cheaper prices and the availability of a variety of colors and patterns. Quilts that continued to be made at home with a sewing machine became more creative and experimental in design, leading to what is now called the “design revolution” in American quilt-making in the nineteenth century and the publishing of patterns in women’s books and magazines. However, near the end of the century, widespread industrialization, the ability to purchase ready-made goods or simply use home technology to make items more quickly, gave women more free time and allowed them to pursue activities outside of the domestic sphere. Many women got jobs, whether in factories, schools or offices, and began to earn their own income. Eventually, women would no longer be solely defined by their domestic roles and handcrafts. Ellen, herself, is known to have become involved in a number of community groups as she grew older, including the Summit Chapter of the Eastern Star, the Baptist Aid Society in Mt. Vernon and the Methodist Aid Society in Mt. Horeb. The recording of Ellen’s participation in these groups testifies to this shift in culture. Not only is Ellen remembered as a loving wife and mother, but as an active member in her community. Too frequently donated to and exhibited in museums are only the quilts that were made to mark important events: a marriage, a birth, a community fundraiser or the onset of a war. Other quilts exhibited tend to be those with very difficult and visually impressive patterns; they display the height of design from each era. While those quilts are beautiful to look at and perhaps come with an emotionally touching story, they limit one’s contemporary understanding of the tradition of quilt-making. Quilt-making history is not about jumping from one perfect design to the next, but rather it is marked by a number of transitions, or “between” periods. Many quilts, like Ellen’s, were made specifically to be used on the ordinary days lived between special events. Young girls who progressively learned new techniques and patterns were slowly transitioning to womanhood. The continued invention of new patterns, dyes, fabrics and ways of making demonstrated a transition in American culture from handmade to industrial, and even the eventual transition from female domesticity to roles outside of the home. Quilt-making, itself, is about a process or transition, a piecing together of separate blocks to create a larger, connected entity. Why, then, are quilts of “transition,” those created by less experienced makers or for everyday use, so easily ignored by contemporary viewers? Perhaps value is more evident in pieces of “wonder,” but it can be argued that there is still great value in quilts like Ellen’s; they remind one of the significance in transitional periods. The slight imperfections of her quilt and its simplicity of design, mixed with a clear sense of precision and accuracy, exhibit Ellen’s learning process in tangible form. Its status as beyond beginner level, but not yet perfectly executed quilt, clearly attests to the long tradition of passing on domestic education from mother to daughter. Also, Ellen’s use of both hand-piecing and sewing machine reflects America’s cultural situation at that time; the handmade, pioneer present was being tightly held onto, but one could feel the push of a more industrial society inching closer. Ellen’s quilt may not mark a special event or display fantastic designs, but it holds a deep resonance for the Wisconsin pioneer culture that it sprung out of. Returning to the theoretical basis of this analysis, one can now see what Ingold meant when he described crafts as being created through the intermingling of people and materials in specific environments. Certainly, Ellen’s quilt is a direct product of Ellen, her family, her geographic location and nineteenth century American society, in general. It is because of this strong connection to its own culture that, according to Greenblatt, it has a resonant power within contemporary museum collections. Ellen’s quilt forces one to think deeper, beyond formal aesthetics, about a specific cultural setting and that is what makes it so valuable for contemporary viewers. “19th Century Immigration.” Wisconsin Historical Society. Accessed April 11, 2016. “Bed.” Object Description, Old World Wisconsin (Wisconsin Historical Society), 2009. Wisconsin Decorative Arts Database (OW1976.130). Giannetta, J. “The General Store in a Pioneer Community.” Last modified in 2011. Architecture, 80-91. New York: Routledge, 2013. Kort, Ellen. Wisconsin Quilts: Stories in the Stitches. Virginia: Howell, 2001. Mt. Horeb Historical Society Staff. Visited March 28, 2016. Parker, Rozsika. The Subversive Stitch. New York: Routledge, 1989. Robertson, Elizabeth Wells. American Quilts. New York: Studio, 1948. America, 107-206. Philadelphia: University of Pennsylvania Press, 2007. “The Sweet Family.” Donald Park Website. Accessed March 28, 2016. Woodburn Sr., James D. “Intro.” Mt. Horeb Historical Society. Creators, Collectors & Communities by by Erin Green is licensed under a Creative Commons Attribution 4.0 International License, except where otherwise noted.